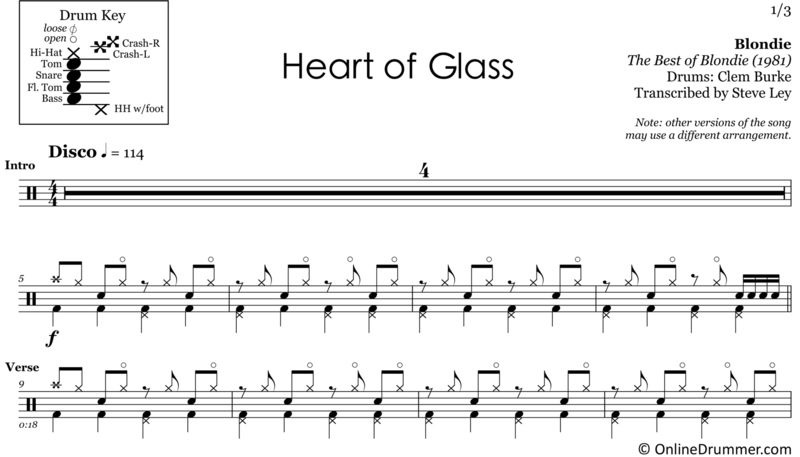 The full drum sheet music for “Heart of Glass” by Blondie from the album The Best of Blondie (1981). Blondie’s disco hit “Heart of Glass” ranks number 259 on the Rolling Stone’s 500 Greatest Songs of All Time list, and number 56 on the UK’s official list of biggest selling singles of all-time. The following two measure disco beat is cycled throughout the verse sections. The hi-hat is played on the off-beat eighths and hi-hat ‘slurps’ are heard twice in the first bar and three times in the second. Different versions of Blondie’s classic hit range from three-and-a-half to five-and-a-half minutes. The sheet music reflects the ‘special mix’ version of the song from The Best of Blondie album (1981). It includes an extended outro section, which features Clem Burke’s distinctive sixteenth and sextuplet based drum fills. The single version of the song is otherwise the same, but does not include the extended outro section.